As the first boss in the Tomb of Sargeras you'd expect it not to be overly complicated, and indeed it's safe to say that Goroth is a straightforward pit lord. While in a lot of pain, especially when moving, Goroth simply cannot give up his fondness for bowling. While the "main" raid positions itself near the center of the room to bait the spawning of bowling pins, Goroth will pick a random member as his target to lob a giant fel bowling ball at. The objective here is simply for said player to ensure the ball will roll through enough pins lowering the damage of the impact which is spread onto the raid. Seeing how bowling might not be a successful tactic Goroth backs his strategy up with a game of peek-a-boo. Aside from these 2 mechanics there is some being turned into living bombs and the room getting cluttered will fel eruptions from time to time. 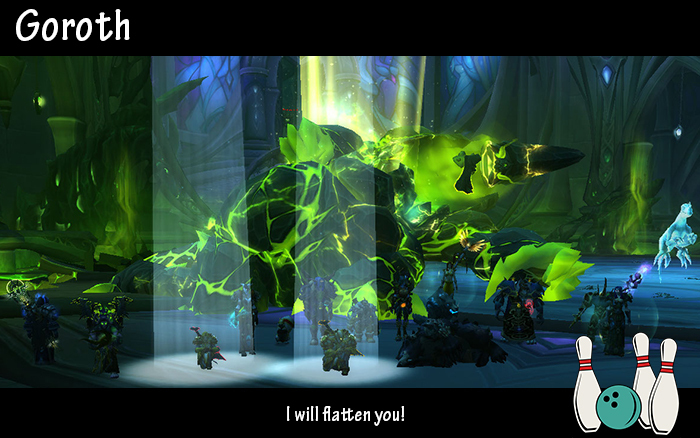 I guess blizzard is starting a trend here with LoS style mechanics for the first boss of a raid instance.